Tottenham Hotspur midfielder Mousa Dembele has been banned for six games by the Football Association for violent conduct against Chelsea's Diego Costa. Belgium international Dembele appeared to eye-gouge forward Costa during Spurs' 2-2 draw with Chelsea on Monday. Referee Mark Clattenburg did not punish the 28-year-old during the game. Dembele chose not to contest the charge, and will now be unavailable to manager Mauricio Pochettino until Spurs' fifth game of next season. He has made 29 appearances in the league this season, scoring three goals. 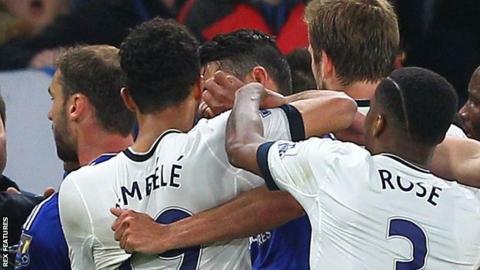 Dembele was one of nine Spurs players booked in the draw at Stamford Bridge - a Premier League record for one team. Monday's result ended Tottenham's hopes of winning the Premier League. Pochettino's side have two games remaining this season, against Southampton and Newcastle, with three points almost certain to secure second place. Stoke and former Republic of Ireland keeper Shay Given told BBC Radio 5 live that he thought the punishment was "way too high". "Looking at the incident, did he stick his finger in his eye and actually gouge his eye?" he said. "I've seen worse tackles on the field which don't get a suspension or a maximum of three matches. If someone is going to go in two-footed, lunging, and their opponent are out for six to nine months with a broken leg and they don't get a ban - I don't understand that. "Dembele's fingers weren't right in his eye. He scraped a bit of his face. I think it is harsh. I know the FA are trying to send a message that this isn't acceptable, but I've seen worse things on a football pitch." Former West Brom striker Jason Roberts agreed, saying: "Things happen on the pitch that can genuinely hurt somebody - like Fellaini's elbow on Huth. That in my opinion was much more dangerous and more of an issue than what Dembele did." LISTEN: Given tells BBC Radio 5 live he had "seen worse tackles"